Summer is a time for Arizona student-athletes to start preparing and setting standards for the upcoming season. Much of a team's success depends on the amount of off-season work they put in. This summer, the majority of Arizona student-athletes have been on campus training for the upcoming seasons. Every day during the summer, student-athletes are reaching individual goals like getting stronger, faster, or mentally tougher. They are also working on other elements such as mobility training, power training, multidirectional movement skills and flexibility. Student-athletes are still working hard academically throughout the summer. After morning trainings, many attend summer classes and keep up with their schoolwork. They continue to balance hours of strength and conditioning trainings while maintaining their grades in order to excel every week. Arizona Athletics sets itself apart from other top programs in the country because of the excellent facilities and educated staff it provides student-athletes. These top-tier facilities allow our student-athletes to train during the summer, and continue to be dedicated to improving in the classroom and in their sport. Without the generous support from Wildcat Club members like you, our student-athletes could not continue being so successful. Did you know you can designate your donation to support specific sports or programs, like strength and conditioning? 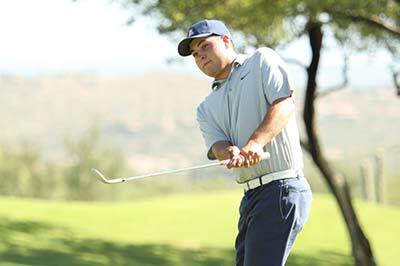 Junior David Laskin was an everyday fixture in the men's golf lineup last season. After shooting four rounds of par or better as a freshman, he scored 21 rounds of par or better as a sophomore and looks to be an instrumental piece of the team heading into the new season. Looking back at your sophomore season, how would you evaluate your year? I would evaluate my year as successful. As a team, we were able to complete a goal of making an NCAA Regional. Although our ultimate goal of winning a national championship was cut short, we made great strides and all the underclassmen were able to gain some more experience, myself included. I struggled a lot in the fall putting too much pressure on myself to play really well instead of just playing golf, but I was able to turn it around in the spring. I started to compete more for the team, and the team score, and it allowed me to play more freely, which overall turned into better scores and a sub-72 scoring average for the spring. What is a favorite moment or memory for you of last season? My favorite memory from the year was definitely winning our home event at the Arizona Intercollegiate. We were able to play an awesome final round and upset the second and third ranked teams in the country. I put together a great round of 65 in the final round to help propel us to victory. Being able to come off the 18th green, unsure of where we stood, and then to learn that we had won the tournament was just an amazing feeling. It was a big deal to give the team confidence as we moved on to play some great golf the rest of the spring. What are some of the biggest things you are working on or developing for next year? This summer I am going to be working on a few areas of my game heavily. I played one round with George (Cunningham) last year and saw how great he was at controlling his distances and trajectory of his scoring clubs that gave him tons of opportunities during the round. I identified that as an area I need to improve. I want to improve my short game as well, as all the players on the PGA Tour chip it great and putt the ball very well. Lastly, I need to continue to work on my mental game. I have been working with Dr. Amy Athey (from CATS Medical Services) on my mental game and how to approach different areas of my game, which includes emotion control. What do you like the most about playing golf for Arizona? The best thing about playing golf at the University of Arizona is definitely the team atmosphere. We are always competing with each other, but at the same time, we love to see each other play well. We have great chemistry that isn't found on many teams. We love being around each other off the course and love pushing each other on the course. How important are the resources to you as a student-athlete? The resources are extremely important to student-athletes. Having a great staff of Academics, Strength and Training, and Equipment are huge to have as a student where that support is with you every step of the way. Academics allows us to succeed in the classroom with great facilities to learn and further our education. The Ginny L. Clements Academic Center is a great spot for tutoring, studying for tests and working on other important assignments. The strength and conditioning staff helps improve us as a player, by keeping us healthy and in shape for the season so that we can compete at the highest level. The training rooms and McKale weight room are great resources for us to use. The equipment resource is great because who doesn't love to get gear with the block A on the chest to have to wear proudly? Having (equipment manager Brian) Brigger there to help us with this aspect is great because he understands what we need as golfers and athletes. What does the Wildcat Club mean to you and your experience as a UA golfer? I would like to say thank you to all the donors and fans; without either of them the University of Arizona Athletics program would be nowhere near what it is today. The support that we get from those donating money shows how great the Wildcat family is! It's a great feeling to have fans who genuinely want us to succeed as athletes, students and people. The support that your donations give us is second to none, and it allows all our student-athletes to have a world class experience at a world class university. I am so proud to be able to represent all of you when I wear the Block A on my chest and compete my heart out for all Wildcats! So thank you for all your support! It never goes unnoticed by your student-athletes. 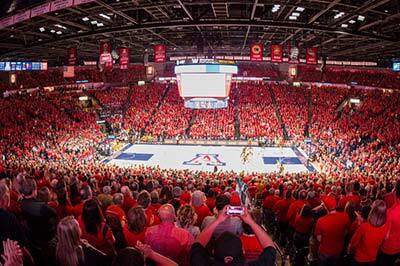 University of Arizona Men's Basketball season ticket holders who are also Wildcat Club members eligible for complimentary general admission parking (Coaches level to Golden) will choose their season parking online this season. They will select their preferred parking permit based on what they are eligible for and what is available using an interactive map. They can also purchase parking permits on the site. Diamond and Platinum Wildcat Club members receive reserved parking assignments offline this year. Season ticket holders at the Bear Down benefit level will have the opportunity to purchase a season parking permit online as well. On Thursday, August 9, eligible Wildcat Club members will receive an email notification with a time slot for when their access to the parking selection system begins. When your timeslot opens, you may login to make your parking selection. We strongly urge you to log-in as soon as possible to your timeslot to ensure the most choices. Timeslots are spaced a few minutes apart over a two-week period from Monday, August 13 to Monday, August 27. All timeslots initially “go live” on Monday-Friday between 9 a.m. and 4:45 p.m. That way you can reach someone on our staff if you have questions or need assistance. However, once your timeslot opens, you are welcome to login anytime to make your selection, 24 hours per day. Timeslots are allocated based on annual benefit level then priority points. 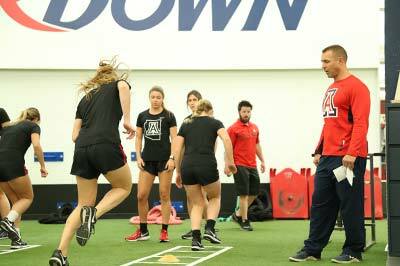 Jim Krumpos has been working with student-athletes at the University of Arizona for more than a decade. A certified Master Strength Coach, Krumpos designs and implements year-round sport specific training programs that focus on strength, speed, agility, explosiveness, movement, and conditioning. His duties also include technique instruction, testing, and evaluation of Arizona's student-athletes. What is the main objective of the strength and conditioning program? The main objective of the strength and conditioning program is to help student-athletes' sport performance, which is why we're getting away from the old school mantra of strength and conditioning and going toward sports performance. Getting them stronger, getting them in great shape, as well as enhancing their mobility and flexibility: all that goes into their performance. That is the fun and challenging part of our jobs, figuring out what each athlete needs to improve their performance. At the end of the day, if a kid can bench press 300 pounds but they can't move agilely, it doesn't help us. What can a student-athlete expect when they work with the UA strength and conditioning program? They can expect to be pushed to their limits and learn to deal with being uncomfortable. A lot of them have been playing their sport for many years, but a lot of them haven't been consistently training. They'll come in here and we will do a lot of things they aren't familiar with. What role does nutrition play in the strength and conditioning program? It's a huge part. Nutrition, hydration and rest are more important than what we do, to be quite honest. We try to educate and provide as many resources as we can in those three areas because we can have the best program in the world, but if they aren't taking care of themselves to where those muscles can rebuild, then we are just breaking them down even more. Body composition and having that energy to perform is the difference between that tenth of a second or that thousandth of a second. How has your role changed since being named Associate Athletics Director, Sports Performance? I still have my team responsibilities, which is what I love, but I have more administrative responsibilities. Some include managing staff and working closely with the upper administration showing them how we are training and taking care of our student-athletes, providing a high level of care while making sure it's done in a safe and efficient manner. What does the support of the Wildcat Club mean to you? They are responsible for our strength training facilities. Take a look at The Bill Estes Jr. Family Strength & Conditioning Center and the Cole and Jeannie Davis Strength and Conditioning Center as well as the Lowell-Stevens Football Facility. Donors are instrumental in providing us the support we need to build the state-of-the-art facilities that we have and provide the equipment that we have. Benefits Update: Check out Our New (Digital) Home! Have you noticed a new, fresher look to our website, wildcatclub.org? If you haven't checked it out yet, drop what you're doing and explore it immediately! 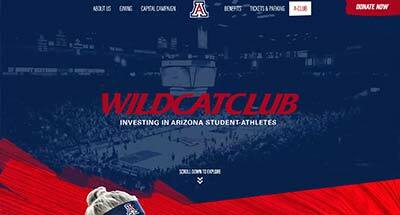 We think you will find the new site useful, easy to navigate, and full of valuable information about Arizona Athletics and the tremendous impact your support makes to our 500 student-athletes. While you're there, check out the pages about current capital campaign projects, membership benefits, and other ways you can support your Wildcats.